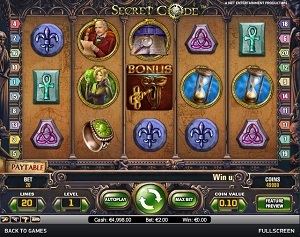 Secret Code is a mysterious online video slot game from Net Entertainment that has been released in October 2010. This online video slot machine game has 5 reels and 20 pay lines. The theme of Secret Code is inspired by the hidden secrets and mysteries of the Illuminati, a purported conspiratorial organization which is alleged to mastermind events and control world affairs by means of corporations and governments in order to create a New World Order. Speaking of Illuminati, most online slot players will definitely think of the movie (inspired by the novel) Angels and Demons by Dan Brown. Secret Code actually does have some features and aspects that resemble that story about the mysterious group of Illuminati. In the Secret Code slot game, you will join a blonde-haired woman who seeks for the secret of the code of the Illuminati and a much older-looking Professor Robert Langdon (the protagonist of the Angels and Demons novel). A lot of online slot players would love to play for free first whenever they encounter a new online slot game so that they can find out if they like that game enough to spend real money in it. Therefore, whenever they see that a certain online slot game is powered by Net Entertainment, they are sure that they can instantly play that game, without the need to download anything! As ominous and dangerous as it may seem, the Secret Code online video slot is an absolute joy to play at, especially for those who have a fascination or are just plain curious about these so-called Illuminati – are they angels or demons? Secret Code features free spins, an expanding wild symbol, a gamble feature, a maximum cash jackpot of $10,000, a maximum coin jackpot of 20,000, and an interesting bonus game that requires you to unlock treasure chests and find out if those masked statues are either an angel or a demon! Net Entertainment is popular for its quality graphics and realistic sound effects when it comes to their wide array of online video slot machine games. In Secret Code, they have really done a very good job of incorporating a video slot game together with a mysteriously secret Order of the Illuminati. The symbols are drawn in a very detailed manner and even if most of the drawings are in a dark color, you will still play for a long time as it does not actually strain or hurt your eyes. The characters they used have animated programming once you have hit them, such as the Illuminati Member Wild Symbol wherein the Illuminati member will activate put a dagger into a statue to reveal a hidden secret floor panel. The overall graphic design of Secret Code shows many different colors such as blue, green, brown, purple, black and red. Constant background music of faint Gregorian-like chanting and bells tolling can be heard. When you spin the reels, creaking sounds will be heard, such as a pulley is being activated. Soft, high chanting music or tinkling bells is programmed whenever you get winning combinations. There are no card deck symbols available in the Secret Code online video slot game. The regular symbols that you will find in Secret Code are the Yin Yang Ring, Sun Ring, Celtic Triquetra, Celtic Cross, Fleur De Lis, Celtic Ring, Hourglass, Book of Secrets, the blonde Treasure Hunter, and of course, the Symbologist. The Wild Symbol is the hooded Illuminati Member (dressed like a monk). The Illuminati Member wild symbol acts as a substitute for all other symbols (except the Scatter symbols) in order to help you complete a winning combination. The Illuminati Member wild symbol only appears on the 2nd, 3rd, and/or 4th reels, and this will expand (Expanding Wild Symbol) in order to cover the entire reel to complete winning combinations. In Secret Code, there are 2 Scatter Symbols – the Escutcheon Rim and the Secret Room Bonus scatter symbols. Scatter symbols mean that they do not need to appear in a line (on an enabled pay line) for you to win. • The Escutcheon Rim scatter symbol can be scattered anywhere on the 5 reels for you to complete winning combinations, as long as there are 3 or more Vampire Bride scatter symbols that appear. If you hit 3 or more Escutcheon Rim scatter symbols, you will activate the Free Spin bonus feature game. • The Secret Room Bonus scatter symbols that come out anywhere on the 3rd, 4th and 4th reels will trigger the Secret Code Bonus Feature game. Do take note that the Escutcheon Rim and the Secret Room Bonus scatter symbols do not give out any winnings; however, they are your ticket to enter their respective Bonus Feature games. The Gamble Feature will be activated at the end of the Secret Code Bonus Feature game. In the Gamble Feature, you are given the choice to bet the winnings you’ve acquired in the Secret Code Bonus Feature game. Click “Double” if you want to bet all your winnings, or click “Double Half” if you want to bet only half of your winnings. Match the Key to a Correct Box to win. As long as you keep on winning, you can continuously play the Gamble Feature. Do take note that the maximum winning amount is 500,000 coins in the Gamble Feature. If you want to return to the main Secret Code slot game, you can click “Collect” in between rounds. Also, please be reminded that the Gamble Feature cannot be played when the Autoplay function is activated. When the Gamble Feature game is over, you are taken back to the main Secret Code slot game, and your bonus prize game winnings are included to your win total. The first Bonus Feature game is the standard one (free spins) – it is triggered when you hit 3 or more Scatter Symbols (Escutcheon Rim) that are scattered anywhere on the reels. The Escutcheon Rim scatter symbol is not required to come out in a line, and on an active pay line for you to win. Simply click on an Escutcheon Rim scatter symbol to unveil the number of Free Spins you will get along with a Multiplier value. While you are playing the Free Spin Bonus Feature game, if you get 2 Escutcheon Rim scatter symbols, your multiplier value will increase by the number of scatter symbols that were shown. Any multipliers that you have won during a Free Spin will automatically be added to the current multiplier value. Do take note that the maximum multiplier value that can be given is at 20x (times)! When the Free Spin Bonus Feature game is over, you will be then taken back to the main Secret Code slot game, and your Free Spin game winnings are included to your overall win total. Note #1: The Secret Code Bonus Feature game can be activated while playing the Free Spin Bonus Feature game; however, the Free Spin multiplier will not multiply the winnings that you have won during the Secret Code Bonus Feature game. The second one is the Secret Code Bonus Feature game. It is triggered when you get the Secret Room Bonus scatter symbols (which can appear anywhere on the 3rd, 4th, and 5th reels) to appear simultaneously. You will be taken to a room with 5 masked statues – choose a key and see if they are angels or demons. You will have to match the keys to the chests in order to find out the truth. For every angel you unveil, you will be awarded a bonus prize. When all of the keys have been used up, the Secret Code Bonus Feature game will end. Note #2: At the end of the Secret Code Bonus Feature game, you are actually given the choice to either return to the main Secret Code online slot game, or you can bet your winnings in the Gamble Feature. Note #3: Only one bonus game is awarded for every single spin. Secret Code has 5 reels where you may bet on as many as 20 pay lines. The minimum bet is 0.01 and the maximum bet is 0.50 per line. You may wager from 1 up to 5 coins per pay line. Those who frequently play online casino games usually love to stay longer on online slot games that have an Autoplay function. Good thing that Secret Code is equipped with one! You can have the game spin automatically for you with the Autoplay function that can be found on the lower left side of their game screen or you can find it just beside the Spin button as well. With the simple setting, just choose a button (from 10 to 1000) which means that those are the total number of spins that will be done automatically for you. With the advanced settings, you can choose to Stop Autoplay on any of the following conditions: on any win, if Free Spins is won, if the bonus game is won, if a single wins exceeds a certain amount you indicate, or if your cash increases or decreases by a certain amount you indicate. After putting in your preferences, just click on the Start button, and the game will automatically spin for you while you just sit back and enjoy playing this mysterious yet intriguing online video slot game!